GCB Strategies is a firm dedicated to supporting foreign-born communities who are inadequately represented by the government and number of elected officials. Owned and operated by Melanie Grund, GCB Strategies works with nonprofit organizations on a project-by-project basis to help them set goals, speak to the community, and eventually run candidates in local elections. Through collaboration and consultation, GCB Strategies hopes to strengthen the voices of these communities and empower them to earn representation in the government. As GCB Strategies began expanding after its launch, Melanie decided it was time to develop brand consistency and professional materials. Before coming to Media Genesis, GCB Strategies only had a website that provided a contact form and information about their mission. Our first project with GCB Strategies involved providing a clearly identifiable logo. Our designers were inspired by the business’ female owner and her Irish heritage during the logo ideation process. Logo designs centered on traditional Irish colors and employed imagery of global connectedness. 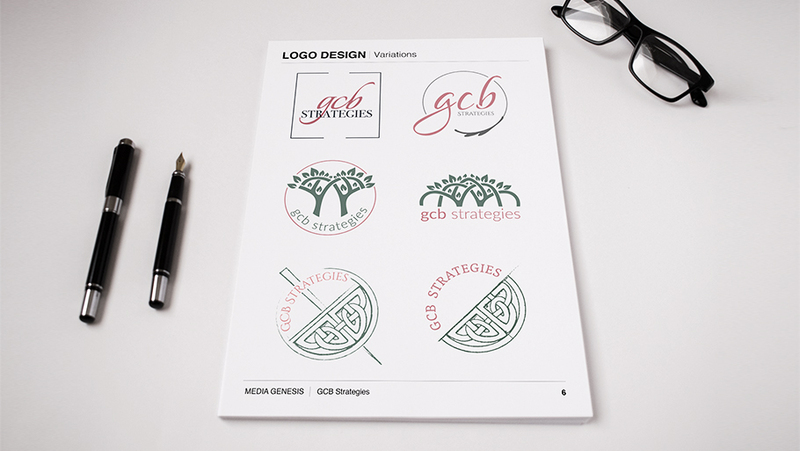 Once we finalized GCB Strategies’ logo, we focused on creating PowerPoint templates and business cards. Our goal was to help GCB Strategies integrate their brand into key elements of business operations. We designed the PowerPoint templates and business cards using the dark green color from the logo with splashes of pink. We laid out the PowerPoint template to adequately represent facts and statistics, which will allow GCB Strategies to effortlessly condense complex information into an easy-to-understand format. After completing these design and brand consultation projects, GCB Strategies was thrilled with the result and hopes to work with Media Genesis in the future for a full website redesign.